By submitting this form,you authorize Sotc.in to contact you for this enquiry. Walking past centuries-old cathedrals in Old Goa, sipping wine at a candle-lit seaside restaurant, admiring gorgeous sunsets at a beach or just relaxing in your luxurious resort—there are a multitude of places to visit in Goa for couples. A magnet for honeymooners, Goa is popular not only because of its sunny beaches but also on account of its cheerful and relaxed vibe, old Portuguese-style buildings, buzzing nightlife and an array of fancy resorts and wellness centres that will pamper you and your significant other extensively. Goa has managed to bag the title of being one of the best honeymoon places in India. Be it lounging on the beaches, indulging in some exciting water sports, or spending blissful moments of togetherness with your better half, or exploring the beautiful Goan countryside, speak to the travel experts at SOTC for excellent Goa honeymoon packages. A verdant paradise for the couples, Goa honeymoon packages are very popular amongst newlyweds. Bound by the foothills of the Sahyadri Range on one side and the Arabian Sea on the other side, Goa is one of the most romantic destinations in India. The state is blessed with scenic beaches, heritage buildings and historical forts, perfect for exploring with your loved one. From the busy beaches of North Goa to the calm and serene ones in the south, couples are spoilt for choices. Take a romantic walk on the sandy beaches or just relax in the hammock and admire the expansive views of the sea. Customise your Goa holiday packages so that you get a chance to explore some of the best places to visit in Goa with your partner. 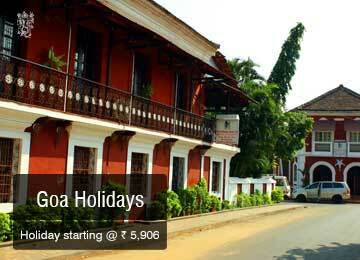 The best time to visit Goa, ideally, is from October to March, when the weather is very pleasant. Your Goa trip is incomplete without indulging in exciting adventure sports like parasailing, jet skiing, paragliding, boating and angling. Goa packages offer exciting adventure activities to make your honeymoon very memorable. Goa is also renowned for its fabulous cuisine, which is gaining immense popularity amongst the visitors, who are willing to experiment with new palates. Enjoying delicious seafood at the numerous beach shacks, relax and watch the day go by, is one of the best things to do in Goa. Goa tourism has beaches as its main focus, but there is a lot more to Goa than them. You can explore its beautiful architecture, quaint churches, green countryside, spice farms and tiny villages. 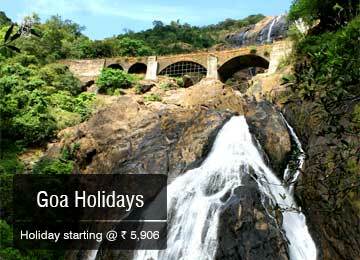 Explore this and much more with exciting Goa Holiday Packages. We offer honeymoon packages in India to destinations like Andaman, Kashmir, Bhutan, Kerala and also to other handpicked international honeymoon destinations such as Bali, Europe, Maldives, Singapore, Switzerland and Dubai. SOTC helps you to plan for a perfect honeymoon spot and have an incredibly memorable experience with your better half. Camp in the sand dunes of Jaisalmer and watch the sky-lit sky, experience the breathtaking sunrise over the horizon of Khangchendzonga at Gangtok, let the allure of captivating Udaipur charm you. Explore these with SOTC as they have some of the best honeymoon packages to choose from. Also, browse through our exclusive India honeymoon packages to explore the best places in India. Don’t forget to carry sunscreen on your trip to Goa. The sun is harsh even in winter months and can cause severe sunburn if adequate protection is not used. Carry extra sets of clothes in case you plan to indulge in water sports or swim in the sea. Check for tides, safety flag marks or the lifeguard for your safety, before going for a swim in the sea. The best way to enjoy Goa on your honeymoon is by hiring cars, bikes or scooters. They are convenient, cheap and you can travel at your convenience.